The big, bold, bright and angular National Museum of Australia sits on the edge of Canberra’s Lake Burley Griffin. It breaks the balance of Walter Burley Griffin’s art deco city, the decorous white of the New Parliament building and the muted green of the landscape with its unruly lines. From a distance it’s an attention-grabbing architectural interloper. Up close, from outside it’s overwhelming. Inside it’s magical. You can dip into the past and find fascinating (and minute) details like the origin of the “furphy”. You can dance through the present (literally) following the moves of young aboriginal dancers. 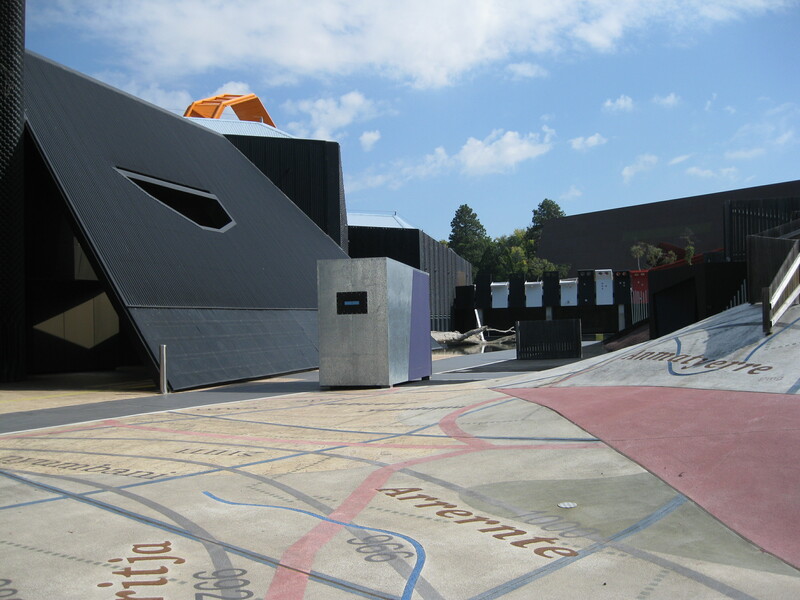 You can design your own space-craft, don three-d glasses and watch it negotiate the 22nd century freeways in K Space’s theatrette. 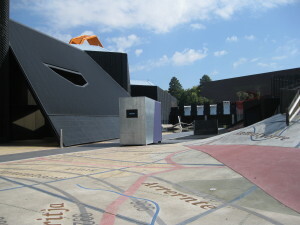 A giant map spreads across the surface of the garden and under the Museum building, bringing together the conventional map of Australia as well maps of aboriginal boundaries, vegetation, geology, roads and electorates. The broad yellow line which intersects the area, represents the line devised by the Treaty of Tordesillas in 1494 to divide the globe into Portuguese and Spanish territories. Red and white poles represent the way that the early surveyors read the Australian landscape. A walk-in camera obsura helps you to interpret the garden. The bush is represented by a stand of gums. The rudimentary white “Dream House” represents the built environment of Australia. The gnome perched on a ledge on the “Dream House” represents the “Antipodean” that Europeans of the Middle Ages imagined lived in the mythical land down under. Always available to guide you and answer any questions on the National Museum of Australia, is a large, well informed, endlessly gracious, multi-cultural and multi-lingual retinue of guides.